I’ve started to read Clockwise’s dialogue in Professor Oak’s voice. That happened on this page. I don’t know why. Aside from: smart, old man, scientist. Guess I could read him in Doc Brown’s voice too, but he’s not quite frantic enough for that character to fit, I think. 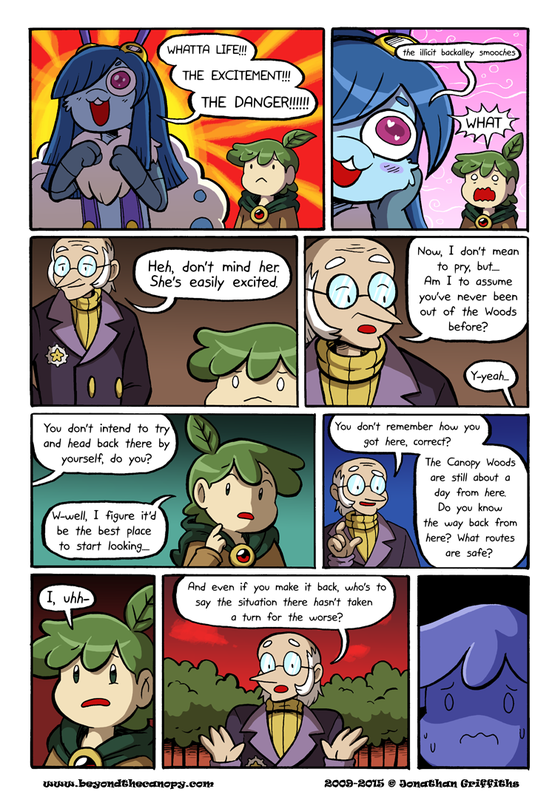 I’m gonna have to start reading him in Professor Oak’s voice too because he is waaay too empathetic and formal to read in Doctor Robotnik’s voice. Another of those weird typos in panel 4. Just wanted to underscore the problem. Yeah, this was around when i first started using a custom font and I hadn’t really hashed out the letter spacing yet, I need to go back and fix this at some point. Are backalley smooches illeegal?.Illicit and illegal are synonyms.